Will EA's Origin Service Revolutionize Mac Gaming? 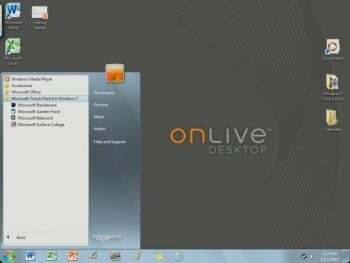 Cloud gaming and desktop computing service OnLive's fate is in: It has been sold to an unnamed entity. The news puts to rest some rumors that had been swirling about its future. If you're a user of the on-demand video gaming service there's no need to worry, at least for now. A spokesperson for OnLive CEO Steve Perlman said the company will continue to operate its OnLive Game and Desktop services during the transition and the new company is well-funded. OnLive said in a statement that "the new company is hiring a large percentage" of its staff across all departments. "All previously announced products and services, including those in the works, will continue and there is no expected interruption of any OnLive services," the statement said. The blogosphere was abuzz Friday with reports that OnLive had fired most of its staff and several employees were seen leaving the Palo Alto, California-based company carrying boxes. Later reports indicated that Perlman held a meeting with employees and told them that at least half of the staff was to be let go. Reportedly, he also said OnLive would be filing for a California bankruptcy alternative called Assignment for the Benefit of Creditors, which protects companies in financial trouble from creditors. Joystiq says an unnamed OnLive employee who was fired told the website the staff was shocked at Perlman's announcement that the company would be restructured. Before the shakeup, OnLive employed 180 to 200 people and Joystick's source speculates only about 20 percent of them received an invitation to work for the new company. But the really interesting dish is that this anonymous person claims that the average peak amount of concurrent OnLive users was only around 1800 -- nowhere near the 2 million people who had registered for the service. Whether this claim is true or not remains to be seen. Several purchase offers have come in within recent months but Perlman was reportedly looking for an offer around $1 billion. OnLive's new owner has not been revealed, but Perlman reportedly said it is not a major company but an individual who is "impressed" with OnLive's accomplishments. According to a report by IDG News Service's Martyn Williams, OnLive's fall to the brink of bankruptcy is a result of a miscalculation in the amount of infrastructure needed in terms of the powerful servers that stream games to inexpensive TV adapters in the homes of its users.